Sarah Jacobs was born on May 24, 1861 in Willunga. 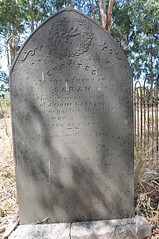 She was the eldest daughter of Henry Gepp, a blacksmith in Willunga, and Emily Welchford. The family lived at 22 High Street Willunga, where Henry had his smithy, house and garden. 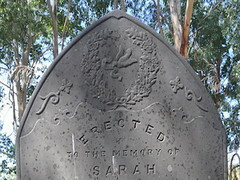 Sarah and her family had to undergo some difficult times when her father’s assets were placed on assignment in 6 May 1870, to be followed by her father’s death in 1871. It may be that his financial trouble was caused by his lingering illness. In May 1882, Sarah married Lilini (Linie) Jacobs, an assistant storekeeper in Willunga. The service was held at the Bible Christian Manse, with Rev. T Piper conducting the service. In 1883, she gave birth to one child, Howard James Jacobs , who lived until 1956. Sarah did not live to see her son grow up. It may have been soon after or even before her marriage that Sarah contracted consumption (tuberclosis). Consumption was the scourge of the colony, although the death rate was thought to be lower than in England. (Adelaide Observor, 15/3/18759, p. 10). Linie would have had to watch his young wife growing thin and enfeebled as she coughed her life away. Do you remember Jacobs, Sarah (née Gepp) ? Then Join up and add your memory here.